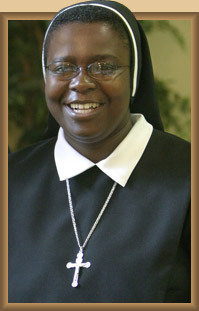 It is with great joy to welcome you to our vocation page. My hope is that our website will help you get an idea of who we are and what we do for the glory of God in the Church. If you have found your way to our vocation page, it may mean that God is calling you to something greater and beautiful. God has many ways of getting the message across to those that He calls to choose Him above all things. I encourage you to be open to Christ’s call in your everyday life and to stand up for our faith in today’s world. As Vocation Director, my work is to walk with young women who are discerning and searching to discover God’s plan in their lives. It is a great privilege to be a part of that journey where young women seek to surrender all that they are to God in a radical way. Yes, it can be frightening when He knocks at the door of your heart, but there is also a great freedom and joy that comes with saying “yes” to God. I urge you to allow God to lead you on this journey of love and trust. Now that you are here, I invite you to come and visit us. You might also want to consider joining us for our discernment retreats, live-in experiences, one week an OLS, and monthly recollections. I challenge you to take that next step which is to allow yourself to be led by Him “Who is EVERYTHING”. As you seek God’s will in your life, I pray that you will have the courage to open your heart to the One who calls each one of us to a way of life that is so beautiful and fulfilling. If you have any questions, you are more than welcome to contact me.